Germantown’s closest neighbor and one of Nashville most happening revitalizations, Hope Gardens makes downtown living delightful with its rows of recently renovated Victorians and adorable cottages. Its popularity has soared in past few years, but its history dates back to the 1800’s when it was first incorporated into the Nashville city limits and developed by German immigrants who constructed the gorgeous, historic homes you’ll find today. But don’t let all that history keep you in the past. Hope Gardens is a vibrant, trendy community with endless opportunities for its homeowners. Walk to the farmer’s market during the summer months, stroll around the Capitol, or grab a bite to eat in one of the many trendy restaurants within a mile. If you’re hoping to be a part of this neighborhood’s exciting history, be prepared to wait. Prices are steep, inventory is low, and homes go fast. Germantown’s closest neighbor and one of Nashville most happening revitalizations, Hope Gardens makes downtown living delightful with its rows of recently renovated Victorians and adorable cottages. Its popularity has soared in past few years, but its history dates back to the 1800’s when it was first incorporated into the Nashville city limits and developed by German immigrants who constructed the gorgeous, historic homes you’ll find today. But don’t let all that history keep you in the past. 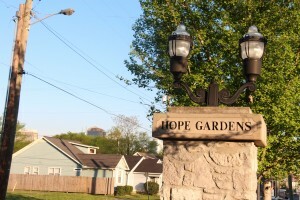 Hope Gardens is a vibrant, trendy community with endless opportunities for its homeowners. Walk to the farmer’s market during the summer months, stroll around the Capitol, or grab a bite to eat in one of the many trendy restaurants within a mile. If you’re hoping to be a part of this neighborhood’s exciting history, be prepared to wait. Prices are steep, inventory is low, and homes go fast.